There are two bodies of texts relevant to interpreting the diolkos and the portaging of ships and goods overland: 1) references to specific instances of generals, kings, and admirals moving ships across; and 2) general (non-specific) references. The citations have been enumerated many times: e.g., Fowler 1932; Wiseman 1978; Cook 1979; Salmon 1984; MacDonald 1984 (see bibliographic references). A thorough listing of the Greek and Latin is available in Apostolos Papaphotiou’s Ο διολκος στον Ιστημο της Κορινθο (Corinth 2007). The following list is a comprehensive one based on references in TLG and the PHI Latin literature disk. Our sources point to eight specific instances of portaging ships between 412 BC and 873 AD. Preparation of Road: 428 BC: The Peloponnesians prepare the roadway to transfer ships, but no portaging results. This is the first point in time that we hear of the idea of transferring ships over the Corinthian Isthmus, although Herodotus 7.22-24 had earlier suggested that King Xerxes could have dragged ships over the isthmus below Mt. Athos—instead of cutting a canal. Primary source: Thucydides 3.15-16. First Portage: 412 BC: The Pelonnesians cart 21 ships over the isthmus. This is the only known portage of ships during the Peloponnesian War. Primary Sources: Thucydides 8.7-10, and Aristophanes Thesm. 647-648. The Aristophanes’ reference has often been read as a random reference to frequent ship portaging in antiquity but it can be more easily read as a reference to the event of 412 BC, which occurred the year preceding the production of the play. A 10th century AD scholion on the Suda explains the meaning of the two lines in terms of the movement of ships. Second Portage: 220 BC: Demetrius of Pharos transfers 50 ships over. Primary Source: Polybius 4.19.7-9. Later Sources: Suda διισθμήσαντα, repeated in Pseudo-Zonaras Lexic. And see also Suda, διισθμονίσαι, repeated in Pseudo-Zonaras Lexic. Third Portage: 217 BC: Philip V transfers 38 ships; his 12 decked ships were too large to be transferred over and have to sail around Cape Malea. Primary source: Polybius 5.101. Later sources: Pliny Natural Histories 4.9-10 alludes to this source when he notes ships too large to be transferred over the isthmus. Fourth Portage: 264-146 BC (Exact Date Unknown): A fragment of Polybius (162) preserved in the 10th century Suda, explains the terms Ὑπερισθμίσας and Ἡμιολίαις through a reference to a portage ofkeletes and hemiolias over the isthmus. This event apparently refers to a portage over the Isthmus of Corinth but is different from those known from Polyb. 4.19 and 5.101 (see above). Fifth Portage: 172 BC: A mostly dead King Eumenes is transferred over with his fleet. Source: Livy 42.16, is the only reference to this event. 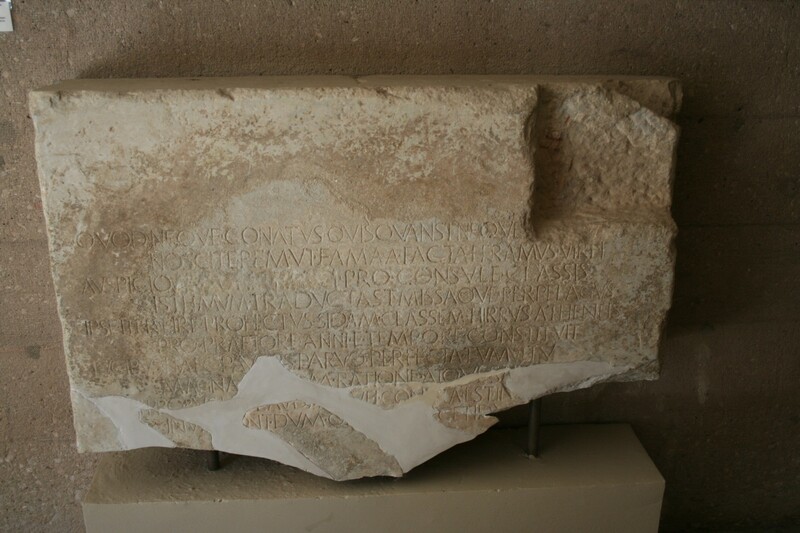 Sixth Portage: 102-101 BC: Corinth Inscription published in Corinth VIII.2 no. 1, and CIL 12.2 no. 2662, among many (shown below). Marcus Antonius, grandfather of the famous Mark Antony, drags a fleet across. Number of ships unknown but the inscription describes the event in spectacular and heroic terms. Seventh Portage: 30 BC: Octavian drags ships over the Isthmus allegedly because of the winter weather. Number of ships unknown. Source: Cassius Dio 51.5. Later source: The 16th century metropolitan of Monemvasia refers to the event in his Chonikon Maius in a passage (396 G) comparing Mehmet II’s stratagem of ship carting in his siege of Constantinople in 1453 AD, with Octavian’s portage in 30 BC and Niketas Oorphyas’ portage in 886 AD. Eighth and final Portage: 872 AD: The Byzantine commander Niketas Ooryphas drags his fleet over the Isthmus and catches his enemies, Cretan pirates, by surprise in the Corinthian gulf. The primary source for this event is a 10th century chronicle, Theophanes Continuatus Chronographia, p. 300 in the Bekker 1838 edition. Later Byzantine restatements and elaborations include Georgius Cedrenus Chronogr., Compendium historiarum, Volume 2, p. 228; Joannes Scylitzes, Synopsis historiarum, Life of Basil 1, Ch. 31; Joannes Zonaras, Epitome historiarum (lib. 13–18), p. 430 line 9; and Pseudo-Sphrantzes Chronicon Maius pp. 236, 242, and 396 in Bekker 1838. II. General References: Scholars have often referred to three non-specific references to ship portaging over the Corinthian Isthmus that seem to suggest it occurred regularly: Aristophanes, Strabo, and Pliny the Elder. The Aristophanes passage is in fact a reference to the specific portage event of 412 BC. The Pliny NH 4.9-10 passage is evidently based on the Polybius accounts for it refers to the larger vessels that cannot be moved over the isthmus. Only the geographer Strabo gives a truly general account of dragging ships over the isthmus. Strabo alone of ancient authors uses the term “diolkos” in the late first century BC to denote the narrowest part of the Corinthian Isthmus, and not a portage road: cf. Strabo 8.2.1; Strabo 8.6.4; Strabo 8.6.22. In Strabo 8.2.1, the geographer notes that the diolkos was the zone where ships were dragged overland. His particular wording, however, τὰ πορθμεῖα ὑπερνεωλκοῦσιν ἀπὸ τῆς ἑτέρας εἰς τὴν ἑτέραν θάλατταν, reflects Polybius 8.34.12. There is one ancient reference to a road across the isthmus: the late Classical (late 4th-early 3rd century BC) writer Pseudo-Scylas refers to a trans-isthmus road that runs 40 stades in Periplus 40.4, but he does not call it a diolkos or mention portaging. The late Roman grammarian Hesychius refers to the Corinthian diolkos as a “place” between Lechaion and Kenchreai, but he is reflecting Strabo. Apostolos Papaphotiou, in his book, Ο διολκος στον Ιστημο της Κορινθο, refers on pp. 124-125 to two western sources of 12th century date but neither provide clear evidence for the contemporary movement of ships overland. The first source, a testimony by Enrico Tino about a boat from the west that ended up in Constantinople, does not state that the boat went over the isthmus. The second source, Edrisi’s Geographie, appears to be a restatement of Strabo 8.2.1.